With a sophisticated, classic style and incredibly functional design, you are going to find yourself becoming very attached this new addition to the Joyetech line. As beautiful as it is, it still holds all of that amazing raw power that will have you enjoying your juices to the fullest with bold, accurate flavor reproduction and huge, fluffy, dense clouds that mesmerize. Featuring a 25mm diameter, massive 60ml tank capacity that will keep you well prepared for those long days away from home, convenient top fill design, adjustable triple airflow slots for the ultimate personalization and 510 threading. This is the workhorse atomizer that you've been after for far too long with its sturdy stainless steel construction that's made for durability that can be fully detached and washed. Jotetech is a brand that is very highly respected for their commitment to quality and innovative design process. The Ornate Atomizer completely and totally lives up to its name and it won't disappoint. 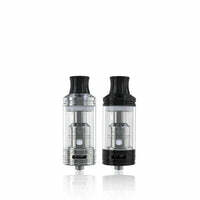 Ornate Sub Ohm Tank - Joyetech has a rating of 4.4 stars based on 5 reviews.